People often say that the reason they eat a lot of fast food and ready meals is to save time, but it’s really not that difficult at all to prepare food in advance so that you can make meals just as fast, saving both time and money after a hard day at school or work. The bonus being that you get to eat nutritious home cooked food, with ingredients you know the origin of, and stay healthy into the bargain! With a little preparation, and some cooking when you get home, many meals can be put together with minimal effort before you need them, and just popped in the oven, either for slow cooking or with a little preparation, straight from raw ingredients in no time. Make a delicious tasty meal by taking turkey steaks and chicken breast/pieces, and marinating them in the fridge during the day. You can either buy a marinade from the supermarket, or if you have time, why not make your own – an Indian version with natural yoghurt, herbs and spices perhaps, or Chinese with ginger, lemon juice, garlic and Chinese spices. When you get home, all you need to do is cook the chicken or turkey in the oven, and serve with some steamed rice which will take a mere ten minutes to cook. If you feel like a change, make your own healthy fried rice, stir frying in a little oil with your choice of vegetables, and some egg . Alternatively, prepare chicken breasts by wrapping them in bacon with a slice of Gouda, or another softish cheese, keep the breasts in the fridge until you need them and then cook them when you get home with some steamed vegetables. It’s quick and easy and much healthier than phoning for a pizza! In the winter, nothing beats a casserole when you get home. 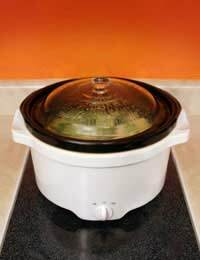 Never considered a fast food, they can still be prepared before you leave if you have a slow cooker or an oven with a timer that can be set to switch on and cook your dinner ready for the time you get home. The beauty of a casserole is that you can add anything you choose to it – whether that’s chicken, beef or another meat, plenty of different vegetables (it doesn’t have to be root vegetables although adding potato to a casserole is universally popular); fillers such as rice and pasta can go in, plus fibre – beans and lentils either to complement or replace the meat content. Just prepare your casserole ingredients the night before, keeping the dish in the fridge, and add the chosen liquid in the morning, and put the whole lot in the oven, timed to cook for a couple of hours. When you get home, you’ll be greeted with the smell of dinner cooking, and no preparation when you get in other than laying the table. Make quick soups in advance, keep them in the fridge and reheat them as needed – just heat up and serve with some crusty bread for a great instant meal. Make your own easy pizzas – either with a readymade base or with an improvised version like a pitta bread or even a Naan bread. Cover with tomato puree or passata, add your choice of toppings, and leave in the fridge until the evening when you can put it in the oven and have your very own delicious pizza in less time than it takes to dial the number for the local takeaway!